Give dinner an Asian flair with a quick stir-fry of chicken, celery, onions, red pepper and almonds in a delicate ginger-flavored sauce. Heat 2 Tbsp. oil in large skillet on medium-high heat. 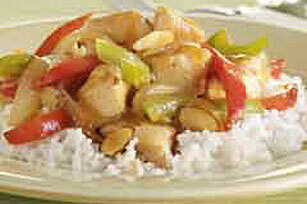 Add vegetables; cook and stir until crisp-tender. Remove from skillet; cover to keep warm. Add remaining oil to same skillet. Add chicken; cook and stir until chicken is done. Stir in broth mixture; cook until mixture boils and thickens, stirring occasionally. Add vegetables and nuts; mix well. Serve over the rice. Reduce oil to 2 Tbsp. and substitute 2 pkg. (6 oz. each) OSCAR MAYER CARVING BOARD Flame Grilled Chicken Breast Strips for the cut-up fresh chicken. Cook vegetables in oil as directed. Do not remove from skillet. Add the chicken breast strips and broth mixture; continue as directed. Cutting boneless skinless chicken breasts into pieces can be a slippery task. Make it safer and prevent the knife from slipping by cutting the chicken while it is partially frozen. The firmer chicken is much easier to cut and handle.